At the Institute of Public Speaking, we most certainly excited to announce a new arrival to our training options. As of August 2015, our Boston MA, Manchester NH and Providence RI public speaking course line up will expanding. The Institute of Public Speaking is happy to announce the much requested follow up to our popular Public Speaking Bootcamp classes. Our new Public Speaking Bootcamp II – Advanced Public Speaking Bootcamp will expand upon our successful training options. This hands-on, exercise based course has you up speaking and learning by doing. With dozens of scientifically proven hands-on exercises you will master the skill of speaking while having fun doing it. Much of these sessions will also provide video reviews of your speeches and coaching on exactly how you can improve. You will learn, grow as a speaker but most importantly have FUN doing it. Many public speaking training offerings are mostly lecture and very little practical exercises to help you absorb the skills. We take the opposite approach. You get the knowledge and expertise you need and then you practice is – there is no better way to learn than by doing. Many other training organizations offer class sizes of nearly 100 students. Small class sizes focus makes for the best learning outcome for our students. You will benefit from one on one time with our expert trainers in ways not available in our competition. Video taping students during exercises and practice speeches helps build confidence and self-awareness. This practice will help you become more aware of your strengths and opportunities for improvement and is vital for improving presentations skills. Our training offerings are conveniently located in both Boston Massachusetts, Manchester New Hampshire and Providence RI. All locations are public transportation accessible and offer ample parking options. 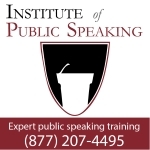 See our specific schedule on our Boston MA public speaking classes , Manchester NH public speaking classes or Providence RI public speaking classes. With over 15 years of expertise in public speaking we know the field and can give you the competitive edge we have offered 1000’s of students over the years. Our experience spans nearly every industry and venue and we truly enjoy helping you take the next step to becoming an expert speaker! Currently this course will be offered on a bi-monthly schedule as of August 2015 in our Boston MA, Manchester NH and Providence RI locations. For more information please check out our course schedule. We are excited to share this wonderful learning opportunity with our students and look forward to seeing you there.